By now you've probably heard "Bad As Me", the deliciously sinister title track from Tom Waits' forthcoming album. How does the rest of the record, out October 25th, stack up? Few artists have managed to create a sound as unique as Waits' while combining it with some of the best lyrics, well, ever. A quick listen to the self-loathing "Pay Me" confirms that Waits' tongue is still razor-sharp. Taking it one step further is "Satisfied", with it's many Rolling Stones references...and Keith Richards appearance. The bang and clatter that we've grown to expect from Waits during the second half of his career is present once again, held down by the increasingly impressive work of Casey Waits on drums. There are some added twists this time around. The frantic scrambling opener, "Chicago" has strong blues notes to it, while "Get Lost" is a blend of '50s rock n' roll, courtesy of guitar work by Los Lobos' David Hidalgo, and Watisian stomp. "Raised Right Man" settles into a groove that will actually have you toe-tapping (which may have something to do with Flea on bass, which is provided by Les Claypool in other places). On a couple of occasions Waits chooses to slow things down. On "Talking At the Same Time", complete with falsetto, it makes for a song nearly perfect for a dark lonely night. It's a misstep on "Back In the Crowd" however, is better suited to his 1982 One From The Heart soundtrack collaboration with Crystal Gayle. An unexpected treat is "Kiss Me", a song that hearkens back to Waits' early career. The bourbon-drenched vocals bring you back to the smoke-filled rooms of Blue Valentine. Everything culminates on the album's penultimate track "Hell Broke Luce". 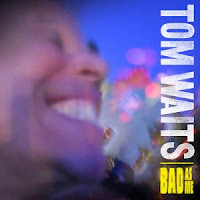 Slightly disturbed lyrics, gruff barked vocals, and a cacophonous arrangement makes for a classic Tom Waits experience. If all musicians really were as bad as Tom Waits, this would be a wonderful world indeed. Best tracks: "Hell Broke Luce", "Raised Right Man"